When University of North Carolina at Chapel Hill sophomore Caroline Alessandro showed up for the first day of English 295, “Reconstructing Frankenstein’s Monster,” she was expecting a typical English class. “I figured we’d be reading “Frankenstein,” analyzing it and maybe looking at some other versions,” she recalls. 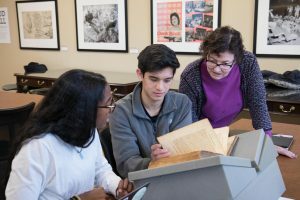 Instead, she and her eight classmates in English 295H devoted the spring semester to a daunting assignment: curating a full-scale exhibition in the Wilson Special Collections Library. 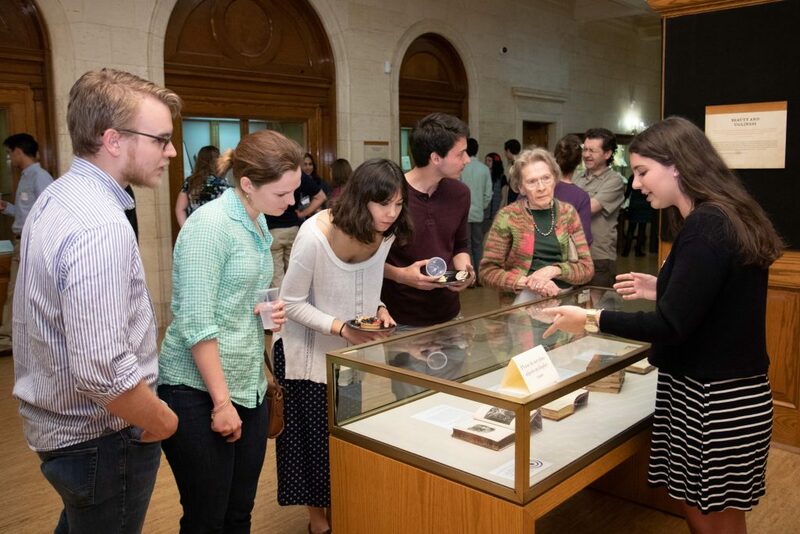 The result, “Reconstructing Frankenstein’s Monster: Mary Shelley’s World in Print,” is the latest in the University Libraries’ biennial collaborative exhibition series with instructors and their undergraduate classes. Rare book research librarian Emily Kader says that the program of undergraduate exhibitions allows students not only to conduct original research, but also to showcase their work. “Frankenstein” was a natural fit because of Wilson Library’s outstanding collections of 19th-century British literature. “This was a chance for the students to go deep while also highlighting a research strength that we have,” says Kader. As students in Moskal’s class immersed themselves in the story of Victor Frankenstein and his creature, they had the experience of working hands-on with the books that informed Shelley and shaped her world view. “We got to connect with the text on a level that we would not have if we were just reading and discussing it as a class,” says Swaminathan-Sipp, also a first-year. Over the semester, the students also grew as researchers. 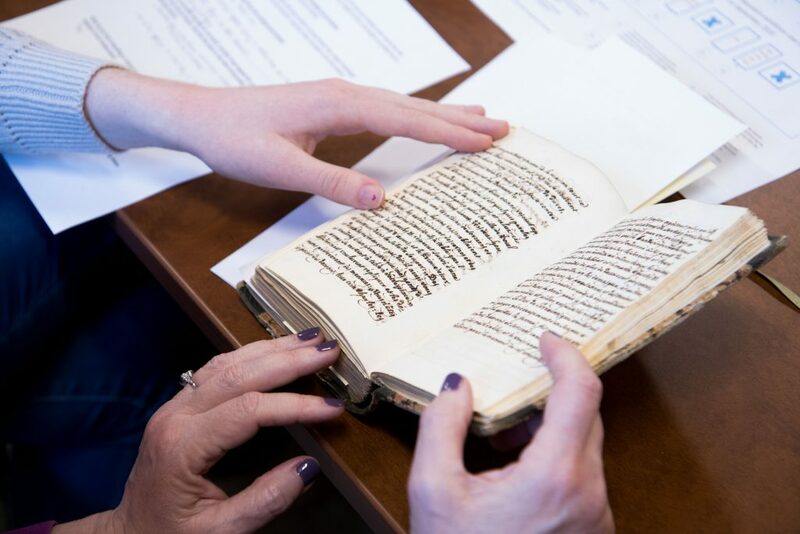 Moskal’s syllabus emphasized in-class experience, as the students worked week after week with their selected items and with the Library’s specialists. Kader and librarian Tommy Nixon guided the students through their research. Interim curator of rare books Elizabeth Ott even procured an 1831 second edition of “Frankenstein” to complement the Rare Book Collection’s first edition. Conservator Jan Paris evaluated the stability of the books for display, while exhibits preparator Rachel Reynolds helped the students think like curators as they selected items to illustrate their themes. She also taught them how to write effective and informative exhibit labels. On several occasions, students and professor learned together, as when Moskal called on a colleague to evaluate a handwritten poem tucked inside a book. The students all say they would take the class over again and would recommend it to other students. Video and photographs by Aleah Howell. Story by Judy Panitch. “Reconstructing Frankenstein’s Monster: Mary Shelley’s World in Print” will be on view in the Melba Remig Saltarelli Exhibit Room at the Wilson Special Collections Library through August 26, 2018. The exhibition is free and open to the public whenever Wilson Library is open. Additional photographs on the Libraries’ Flickr.